Unless you are from Alabama, who knew? I had been hearing about Alabama chicken and the white BBQ sauce for a few years. Just never got around to giving it a try. Hmm, that was an error. 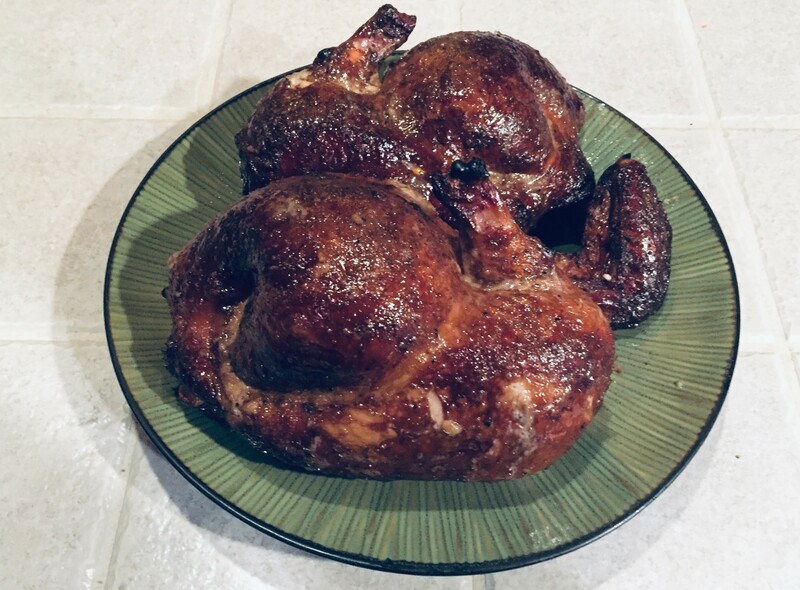 Alabama chicken is an excellent recipe, flavorful with that nice crisp mahogany colored skin that is so amazingly good on chicken, then the white BBQ sauce with some horseradish zip. It's an excellent addition to anyone's personal grilling and BBQ cookbook! Alabama chicken is cooked or perhaps more accurately smoked using a two zone fire and indirect heat as shown above on my Weber kettle. It can be made on a gas grill with a smoke chip box, or chip packets but you will need to ensure that you keep that smoke going. Easy on a Traeger or pellet smoker. I researched several recipes and took what I liked from each of them. A shocker, this really does not have much in the way of chilies in it. That's unusual for my cooking! Check out this great YouTube video from Sean Hayes and his song Alabama Chicken, great song. Ill be listening to this at the BBQ. 2 teaspoons prepared horseradish (creamed is ok too) I like Atomic Brand. Combine all let sit for 15 minutes. 3 cups Wood chips soaked in water, hickory is traditional but mesquite worked nicely as well. Prepare a two zone fire, or prepare for indirect cooking on a gas grill with smoker box. Pellet smoker, your all set. Place your chicken on the cooler side of the grill. Add 1/3 of your wood chips, cover until the smoke slows down likely 20 to 30 minutes. Open the BBQ/grill check the temperature on your chicken, likely still pretty cool. 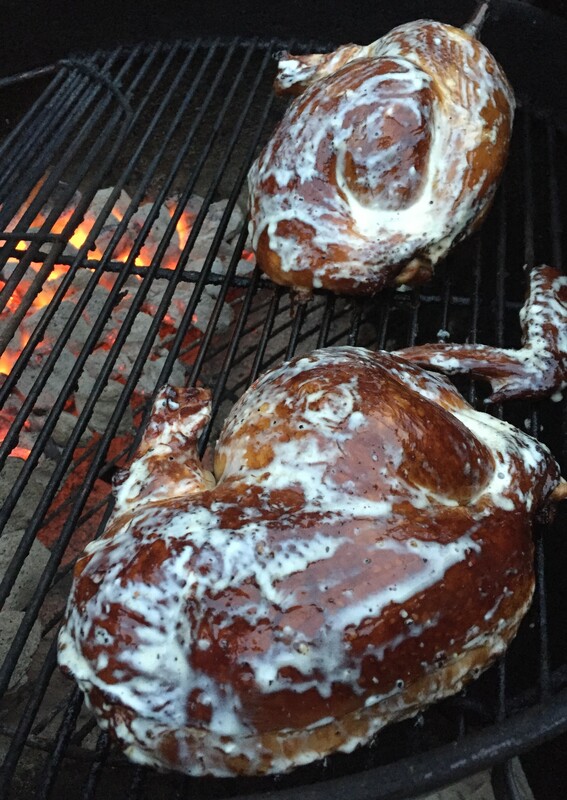 When your chicken is cooked to around 120 degrees then baste the chicken with the Alabama White BBQ sauce. Add another 1/3 of your wood chips. Cover for another 20 to 30 or when the smoke slows down then add more, baste the chicken again. Cover and cook to 165 degrees. The skin is going to be nice and dark brown, crispy and really tasty! Note- if you have one of the BBQ thermometers that can be monitored from your phone makes cooking your food on the grill right super easy. I don't always use mine for steaks or quick cooking food, but for things that take a bit longer or are being smoked they are really a nice amenity and they are affordable. The one my daughter bought me for Christmas works great and I can monitor up to four things at once with different temperature settings. A great Christmas present! Once your chicken is at 165 degrees pull your chicken off the grill and let it rest for around 15 minutes prior to serving. I served the sauce on the side, as I do with most of my smoked or BBQed meats. I served it with a coleslaw with a vinaigrette (so and not to over do the mayo) and some nice soft rolls. This makes killer sandwiches or sliders on those rolls! Pair it up with some beverages and enjoy!